Considerable cloudiness. Occasional rain showers in the afternoon. High 66F. Winds light and variable. Chance of rain 60%.. Rain showers in the evening will evolve into a more steady rain overnight. Low 54F. Winds light and variable. Chance of rain 70%. Rainfall around a quarter of an inch. 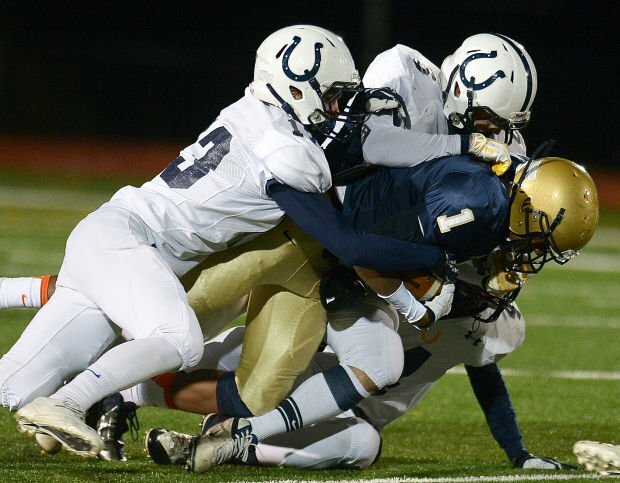 Bishop McDevitt's #1, Bryce Hall, is tackled by a host of Cedar Cliff players late in the second quarter of their game on Friday night at Bishop McDevitt High School. Cedar Cliff's #24,Jacob Scott, makes a dives into the end zone for a touchdown in the first quarter of their game on Friday night against Bishop McDevitt. Cedar Cliff's quarterback #7, Andrew Ford, right, throws for a touchdown in the second quarter of their game on Friday night against Bishop McDevitt. Cedar Cliff's #4, Mike Viti, dodges tackles from Bishop McDevitt's #2, Brandon Stanback, left, and #18, Anthony Dasent, during the first quarter of their game on Friday night at Bishop McDevitt High School. Bishop McDevitt's #5, Andre Robinson, runs the ball for a touchdown in their first posession of the game against Cedar Cliff on Friday night. Cedar Cliff's #17, Kyler Smith, front, picks up a short gain of yards before being brought down by Bishop McDevitt's #2, Brandon Stanback, in the second quarter of their game on Friday night. HARRISBURG — It may be hard to believe in a game where nearly 100 points were scored, but Cedar Cliff’s defense stepped up time and time again. Both teams put up points, but without the Colts coming up with five turnovers and numerous other big stops, it could have been a different story. They did though, and Cedar Cliff left Rocco Ortenzio Stadium with a 49-41 victory over Bishop McDevitt to snap numerous Crusader winning streaks, and more importantly set themselves up for a Mid-Penn Keystone title and a high seed in the District 3-AAAA playoffs that start in two weeks. Three of those turnovers came in the second half, all three coming with McDevitt inside the Colt 30-yard line, poised to get right back in the game or even take the lead, which is something the Crusaders never had after the 2:48 mark of the first quarter, despite bouncing out to a 13-0 advantage less than six minutes into the game. After Andre Robinson’s second score — his first coming on a 60-yard punt return following a Colts three-and-out on the opening possession — the hosts were looking every part of the Keystone Division bully title they’ve earned over the past three seasons. Instead, Cedar Cliff bounced out of McDevitt’s pristine new complex with the first win by a visiting squad, and a share of a three-way tie atop the division with all three teams facing winnable games in Week 10. No Colt played a bigger part in the first-half comeback than Jake Scott. The senior hauled in a pair of first-quarter touchdown grabs to give Cedar Cliff the 14-13 advantage they would never give back, and then pulled in two interceptions within three minutes of each other in the third quarter — both on third-and-long plays the rest of the defense helped force the Crusaders into. Apparently, the man defense is something that was working for the Colts on the other side of the ball as well. Ford was perhaps even better than on the money, as he finished the night 21-for-32 for 407 yards and six touchdowns, including 262 yards and four scores in the first half as his team worked its way to a 35-19 lead. With the Crusaders seemingly content to pound away with talented running back Robinson — who finished the night with 17 carries for 194 yards and two touchdowns to go with his big punt return — the Colts proved they could take it away from ball carriers as well. On the 11th play of McDevitt’s opening drive of the third quarter, quarterback Nick Marsilio found a big hole on the right side, which gave him more than enough room to pick up the first down on fourth-and-1. Already five yards downfield, Cedar Cliff’s Noah Malone wrapped up the ball and tore it away from Marsilio to take away another scoring chance. The Colts would let McDevitt score on the next drive, and get themselves backed into a second-and-18 after a sack, but that didn’t phase them, as Ford found Malone on a fade down the left sideline. The junior outjumped his defender, and finished off the 77-yard score. It wasn’t the first time the route worked for Malone either, finishing his night with six grabs for 205 yards and three scores, with four of those catches coming on the fade. A minute later, with 3:09 left in the third quarter, Malone gave the Colts their biggest lead of the game at 49-27, and Cedar Cliff went into clock-eating mode with running back Kyler Smith. Since taking over the role full-time two weeks ago against Susquehanna Twp., the senior has brought a new dimension to the running game, and he helped chew just enough clock with his 108 yards that the Crusaders couldn’t finish their comeback attempt. After Mike Perloski jumped a screen pass and took it 57 yards to pull McDevitt back within a score with 7:34 left in the game, the Colts ate away about four minutes before having to punt back to the home team. 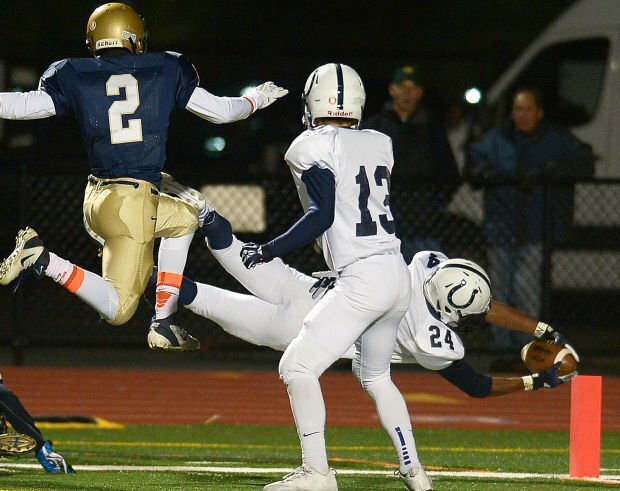 Facing a third-and-1 at the Cedar Cliff 21, the Colts defense stepped up one last time, standing up the sure-handed Robinson and knocking the ball out. After 18 more yards from Smith and a punt, McDevitt had one hail mary crack at it, and Marsilio’s pass fell incomplete.